One of the great things about cooking is that the more you do it, the easier and faster it gets. (Though I’ve also become my own worst enemy in that regard — I do almost all the cooking, even on weekends when I could otherwise have a break from it, because I’m so much faster at it than my husband.) When you know that you can pull together a dinner in the time it takes for water to boil and some pasta to cook, or that you can cook some fresh fish in less than 10 minutes, frozen pizzas start to lose their appeal. But even though I love to cook, there are plenty of days too when I don’t have the energy or am pressed for time to get something on the table for two hungry little kids. And as much as I prefer to cook from fresh, unprocessed ingredients, there are certainly worse convenience foods to have in your pantry than a jar of pasta sauce and a packet of potato gnocchi. Store‐bought potato gnocchi cooks in 2 or 3 minutes, making it the ultimate fast food, plus a nice change from pasta. Check out all the quick and easy recipes for gnocchi from the UK’s Olive magazine for more inspiration. If you like the sound of brandied plums but don’t have time for the cake, just make the plums on their own, which takes only 10 minutes. Serve them with vanilla ice cream, with the syrup drizzled over — no one will complain about not having them in a cake. You could vary this recipe by using your favorite pasta shape instead of gnocchi, and stirring 1 tub of ricotta cheese directly into the sauce along with the spinach to make it nice and creamy. Do I even have to say that bacon would be good in this too? Preheat the oven to 400°F (200°C). Cook the gnocchi according to packet instructions and drain. Meanwhile, heat the tomato sauce, add the spinach and stir until wilted. 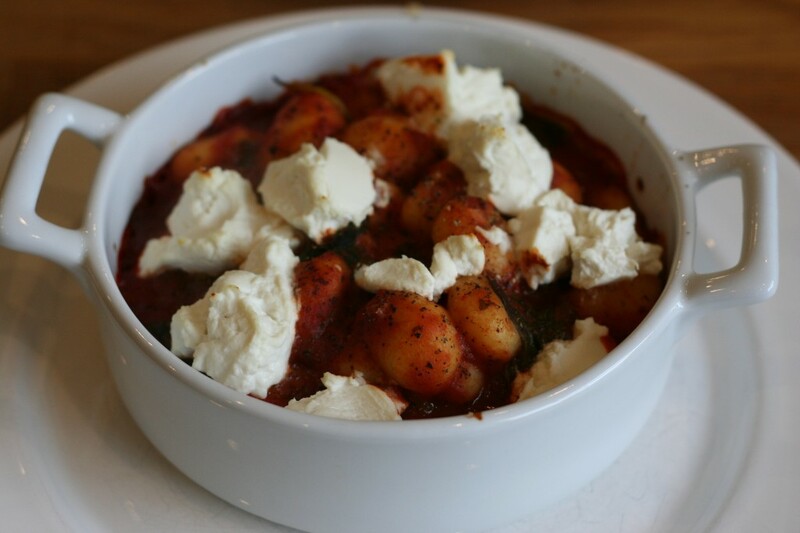 Put the gnocchi in a lightly oiled ovenproof dish, pour the sauce over and dot with blobs of ricotta. Scatter the grated Parmesan over and pop into the hot oven until bubbling and golden, about 10 minutes. This cake is very moist, so it doesn’t really need the brandy syrup drizzled over it at the end, though it’s a nice touch. Instead, you might like to save it in the fridge to drizzle over vanilla ice cream another time. If you have any leftover plums that won’t fit on top of the cake, save them to have with yogurt for breakfast. Preheat the oven to 350°F (180°C). Grease a 9‐inch springform pan and line the base with a piece of parchment paper. To make the brandied plums, combine the sugar, brandy and cinnamon in a frying pan. Cook over a high heat, stirring often, until the sugar dissolves. Reduce the heat, add the plums and cook until they are soft but still hold their shape, about 5 minutes. Transfer the plums to a bowl with a slotted spoon and set aside. Reserve the brandy syrup left behind from the plums. Beat the butter and sugar until pale and fluffy. Add the eggs one at a time to the butter and sugar. Sift the flour and baking powder together and fold them gently into the mixture with a spatula. Fold in the ground almonds and chopped walnuts. Scrape the mixture into the lined springform pan. Place the quartered plums on top of the cake mixture (they will sink into the cake as it bakes). Bake for 40 to 45 minutes, until a cake tester comes out clean. If you think the top of the cake is browning too much, cover it with tin foil. Remove the cake from the oven and leave to cool in the pan for 15 minutes before releasing the sides of the pan. Serve with some of the reserved syrup spooned over the top of each slice.